For a long time, my family reserved the day after Thanksgiving for procuring Christmas trees. In the crisp early morning before sunrise, my grandfather, Bill Johnson (Daddy Bill), would hook a small trailer behind “Black Beauty,” his old rusted black Pontiac Grand Prix. He’d crank her determined, sputtering engine and head across the Cape Fear River from Lillington towards Buies Creek, where he’d pick up one, or some, or all of his adult children for their annual trip. My mother, her sister and her brother would climb onto Black Beauty's dusty velour seats, pray the seatbelts still worked and that Daddy Bill had truly double checked her tire pressure. When everyone was situated with the specifics of their orders (number of wreaths, height of trees, feet of garland), they’d hit the road. The turn onto Highway 421 north towards Sanford marked the formal beginning of the four-hour drive to Ashe County, where their Christmas goods awaited. Bordered by Virginia to the north and Tennessee to the west, Ashe County is North Carolina’s most northwestern county. People often travel there in the fall to witness the vibrant changing leaves of the Blue Ridge Mountains, but I’d argue its one of the most beautiful parts of the state every day of the year. The glimmering, slow-flowing New River winds its way through the county’s emerald green fields, rolling hills and quiet small towns. In the summer, wildflowers and wild blackberries flourish along the riverbanks against a year-round backdrop of aging tobacco barns, lazy dairy cows and hillsides covered with thousands of neatly rowed Christmas trees. In the early 1980s, my grandfather fell in love with the area and purchased a plot of land on a hill above the New River outside of Jefferson, the county seat. He became friends with Dallas and Dot Sturgill, local Christmas tree farmers, who began growing Fraser firs on his land. Thirty years later, Daddy Bill and Dallas are no longer with us, but my family and Dallas’ continue to use that property. 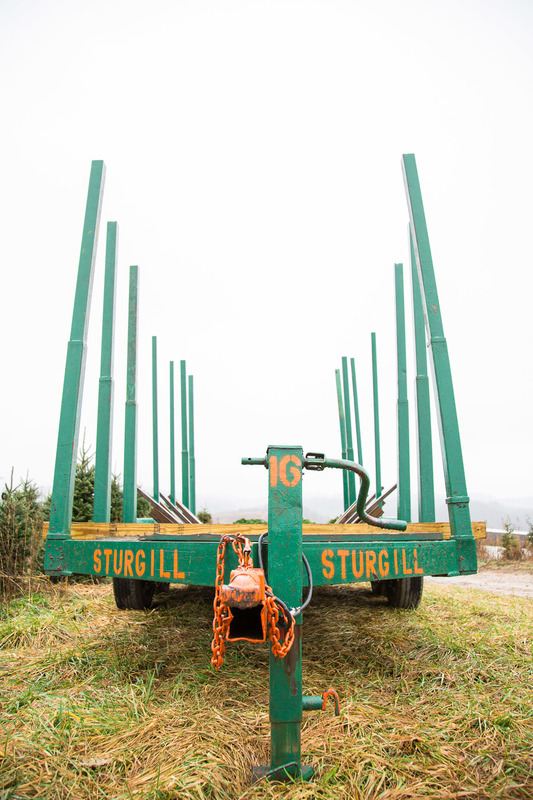 Mine for recreation, the Sturgill's for Christmas trees. Those November Christmas trips brought our families together every year. Why wouldn’t you want a Christmas tree nurtured to life from your very own soil? It was always worth the road trip to my grandfather. The beloved Fraser fir, North Carolina’s signature Christmas tree, has become the region’s most commercially successful crop, and Ashe County happens to be the state's most productive county. Today, North Carolina Fraser firs are shipped all over the world during the holidays. This wasn’t always the case. Fraser firs first appeared as Christmas trees in the late 50s and early 60s when farmers started to cut the tops off of 30-foot tall firs. They’d laboriously hand-bale the treetops before selling them to curious customers drawn to their sturdy branches and boughs that can handle ornaments of many hefts and sizes. Around that time, state and federal agricultural extension agencies began encouraging mountain farmers to cultivate Fraser firs for Christmas trees, and in the mid-60s farmers started planting Fraser fir seedlings solely for that purpose. Once they formally entered the market, demand for the robust, aromatic trees grew quickly. Prior to that, the Fraser fir was primarily grown for ornamental landscaping. The tree transformed the region’s economy. Generations of mountain families had struggled to find a commercial crop suited for southern Appalachia’s soil, elevation and weather. Many relied on subsistence farming and tobacco to survive. Capitalizing on and commercializing the native Fraser fir was a good fit for the region: it must grow at high elevations to thrive, and the mercurial mountain weather doesn't bother it. North Carolina is now the second largest Christmas tree grower in the country, and around 5 million trees are harvested from 40,000 acres of farms — a fifth of the nation's total Christmas trees. Fraiser fir products bring $100 million to the state. The Fraser fir has developed quite the reputation. The National Christmas Tree Association has chosen the North Carolina Fraser Fir as its Grand Champion 12 times. Twelve North Carolina trees have found their way to the White House for Christmas, and seven have come from Ashe County. The days of chopping off the tops of old evergreens and hand-baling are long gone. Machines bale the trees and build most of the wreaths and garland made from leftover greenery. Families and migrant laborers work year-round — planting, fertilizing, controlling pests, shearing — to care for these trees, and Christmas tree operations are often huge; Sturgill Tree Farms alone harvest 150,000 trees a year and employs up to 120 people during peak season. If you have a Fraser fir in your living room, it’s probably between six and seven feet tall and about 12 years old. On average, it’s been visited 100 times by a farmer. Johnnie Sturgill, who manages nearly 40 farms for the Sturgill Tree Farms, says every July he and a few others start walking every single row of trees to tag those that’ll be ready for that year’s harvest. From the last week of October through the first week in December, hundreds of thousands of trees are cut, baled, graded, packed and shipped all over the world — Taiwan, the Caribbean and Mexico. In peak season, you’ll find a dozen tractor trailers parked at Sturgill's loading headquarters, set to disperse trees across the country. “I ain’t smelled them since I was about 12,” says Josh Johnson. Josh, a member of the Sturgill family, has been working with the trees since he was 11. After more than a decade of being around them, the Fraser fir’s notable aroma is lost on him. Josh gets a twinkle in his eye when he talks about the National Christmas Tree Contest. Sturgill Tree Farms is sending a tree to the Vice President's house next year. Selecting a tree for each tier of the contest is a special process. The family starts by picking three or four of their farms to explore. Then they pick 15 trees from each farm that they’ll visit and take notes on every few days. Slowly, they narrow down their options until they have the one they'll send to competition. My family’s annual journey to get trees always marked the official beginning of Christmas, but my grandfather’s death has changed so much for us. The grandchildren are grown and busy. It’s a feat just to get us all together for a holiday meal. We no longer make that trip to Ashe County every year. Some things never change though. For us, Christmas trees will always mean Ashe County, and they will always mean Daddy Bill.